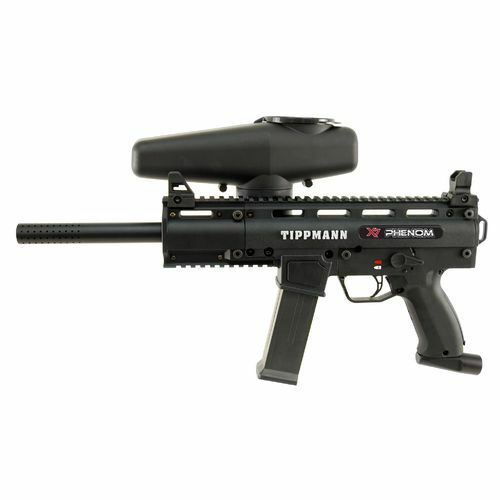 The Tippmann X7 Phenom paintball gun with FlexValve Technology is the first paintball marker to offer the combination of improved air efficiency, superior accuracy, and the flexibility of CO2 or compressed air usage. The new FlexValve operates below 300 PSI for improved air efficiency allowing you to get over 1,400 shots from a 68 cubic inch 4500 psi tank. Also, due to its Spool Valve design, recoil is virtually eliminated for improved accuracy. As an added benefit, the Tippmann X7 Phenoms searless design incorporates fewer wear parts, making maintenance easier than ever. Best of all, because this new marker is built around the existing X7 platform, the Phenom which is nearly 3 inches shorter than the X7 can still accept more than 20 current X7 mods and upgrades, including the popular Flatline Barrel. Players have never been offered such a complete package the performance of a tournament marker... the flexibility of a mechanical marker... the durability of a Tippmann... and the ability to customize their marker with thousands of different looks. The X7 Phenom truly is in a class of its own.